19 gauge, sterile Monoject Magellan hypodermic needle measuring 1" with sliding safety needle. 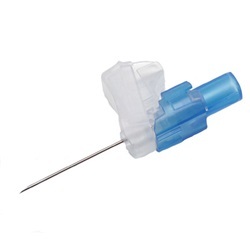 Stainless steel needle is regular wall with beveled point. Blue plastic hub with luer locking connection. Manufactured by Covidien. Comes in a case of 500.